Connect Stormboard to hundreds of other apps with Zapier! Seamlessly connect Stormboard with 1,000+ apps making data transfer automatic so you can focus on your great ideas and not on the technical details. Unless you are an API expert, it can be incredibly difficult to create an automated workflow that will sync data across platforms. Stormboard's new integration with Zapier is here to help! 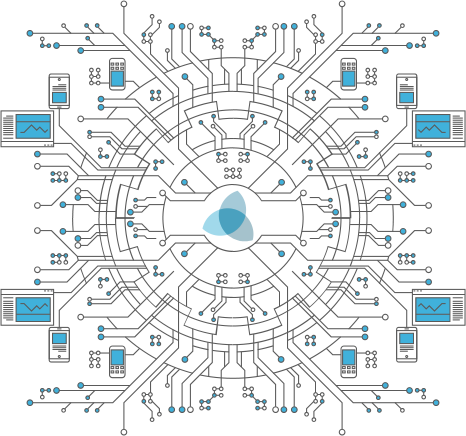 Automated connections called Zaps, which you can set up in minutes with no coding, can automate your day-to-day tasks and build workflows between apps that otherwise wouldn't be possible. Each Zap has one app as the "Trigger", where your information comes from and which causes one or more "Actions" in other apps, where your data gets sent automatically. The best part? This all happens in the background — once it's set you don't need to do anything! 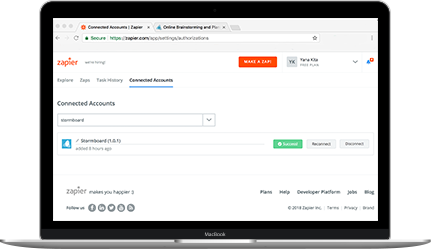 1.Sign up for a FREE Zapier account or log in to your existing account. 2.Navigate to "Connected Accounts" from the top menu bar. 3.Now click on "Connect new account" and search for "Stormboard"
5.Once that's done you can start creating an automation! Use a pre-made Zap or create your own with the Zap Editor. Creating a Zap requires no coding Knowledge and you'll be walked step-by-step through the setup. Visit Zapier's blog about the Stormboard integration or our integrations page to discover even more great workflows you can use to take collaboration to the next level! Do you have a workflow you would like to automate that you don't see here? Let us know!. Not using Stormboard yet to make your meetings better? Sign up for a FREE account now!.